Ethan wakes up one morning to find a very strange cat stuck on his head. The cat, Odds, refuses to budge until Ethan wins a game of probability. Without looking, Ethan must pick out a dime from his coin collection or two matching socks from his dresser, or do something else improbable. If he doesn't, Odds is there to stay, and Ethan has a 100% chance of missing his big soccer game. A very improbable story about a challenging math concept. 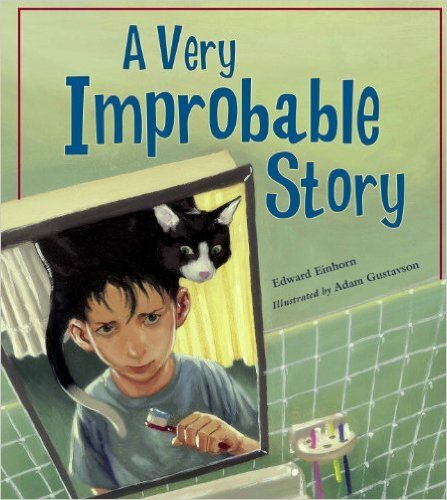 Edward Einhorn's 'A Very Improbable Story' (2008), a title in the Charlesbridge Math Adventure series, introduces the concept of probability (and, to an extent, fractions) to young readers. The story follows Ethan, a young boy who woke up one morning with a talking, and rather bossy, black cat on his head. Odds, the cat, promised to get off Ethan’s head if he wins a probability game. Throughout the story, everyday situations are cleverly turned into probability games. The illustrations by Adam Gustavson are great in helping young readers to visualise probability though we wish this could have been done for every round of the game, particularly in the latter half of the story. We like the imaginative idea of a bossy talking cat, but we were not particularly drawn to the character, as we do not really know its motive: Why did Odds pick Edward? Why was Odds so obsessed about getting Edward to win a probability game? All in all, we like it for the mathematical element of the story, but we would have loved to see a more convincing storyline. Recommended for children aged 8+ years old.